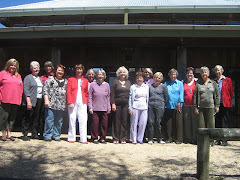 Queanbeyan Evening VIEW Club birthday attended by several members of the LGDVC. where, oh where has our birthday cake gone, oh where oh where can it be??? As in past years, this was a most enjoyable event hosted by the "Queanbeyan Group" Lots of fun and laughter thanks to the VIEWTrapp Singers/Entertainers.